Like I’ve mentioned before, I haven’t had that much experience as an ALT but I’ve tried what can mildly be considered a multitude of activities with those dear students and I’ve come to the awakening that the epiphany I had some time ago is to be trusted. Students revel in competitive games where revel is more than a tad an understatement of their response. Of course, there is an incredibly wide variety of competitive games which I would probably talk about in time to come in an attempt to share the activities I’ve tried that garnered great, or at least positive, response and participation from the students. 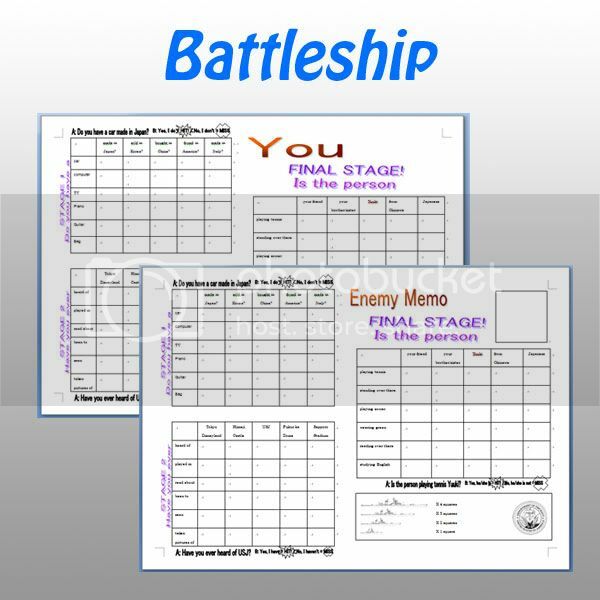 One of which is the good ‘ol Battleship game which had such great responses, I had students playing it while I was doing a new activity with them (which unfortunately means that the new activity wasn’t all that good). Also, while I used that in the 3rd grade students’ class, the 1st grade teacher requested me to use Battleship for her 1st grade students as well for the following activity. If you’ve got no idea what Battleship is like, you might wanna go do a simple search, or I may write more about the rules some time later. I was recently tasked to take the entire 50-minute class of 3rd grade students and since it’s the end of the year, they’ve finished the entire textbook and are all busy with high school entrance examinations, I used the Battleship game with them as a review. I kinda modified the game a little to make it more fun, increase the challenge and maximize their practice. If player A destroys all fleets of player B in stage 1, s/he moves on to the next stage while player B keeps going at the first stage until s/he hits all of player A’s ships. Whoever, finishes the final stage first, wins! I’ve inserted a single grid ship in this game which is not present in the original game so that players have the possibility of catching up even if they do trail at the beginning. The time is 10:15pm. Gotta go have my 2nd dinner.